It has been a very long time since I have done a proper flight with my FSX. In great part because keeping up with software development skills takes up most of my time, then personal stuff (family). And then also a bit over a year ago my Saitek Throttle Quadrant became unstable. The relevant part for the purpose of this post are the three levers or axis because they are the ones that are most likely to become the culprit of any problem. My TQ is configured so that the leftmost two levers are configured as Engine Throttle (#1 and #2) with their inner detents configured as Propeller Decrease Quickly respectively and Engine Throttle Decrease Quickly. So if I fly a single propeller plane I can use the detent on the 1st lever. If on the other hand I fly a multiengine aircraft such as a turboprop or a jet, then it is likely that during landing I would do some sort of reverse thrust (if supported) so when both go through the detents both the Propeller and Engine decrease quickly actions are triggered thus accomplishing the desired result regardless of whethre I fly single prop or multiengine jet. The problem with it is that over time dust tends to get in through into the TQ and even worse, the constant friction caused in the potentiometers where the levers are connected to translate movement into an analog signal that can be digitized, will cause microdust to build up inside the potentiometers. The microdust will create electrical paths and as a result you will notice that even when you leave the levers alone, in the SIM you will notice they bounce up and down by themselves! That is a nightmare because your engine power will fluctuate as well. So, I dove in and cleaned them. They are now as good as new and I wanted to test them in a proper flight. 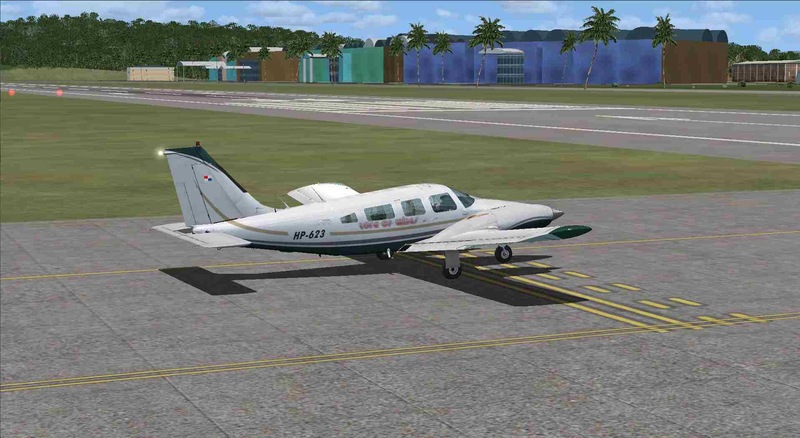 I took my Carenado Piper Seneca II with Lord of Wings livery for a ride out of Marcos A. Gelabert airport (MPMG) in Albrook, Panama city, Panama. I was all setup on the runway, applied full power and off I went! well, so I thought! After passing 3/4 of the runway I had enough manifold pressure, enough RPM on both engines and enough airspeed for take off but pulling on my yoke caused just a minor lift but not enough to get airborne. I aborted take off and repositioned the a/c at the other end where I ended up after the abort. I performed the same maneuver but unfortunately yet again take off was not possible when normally it would do so in a much shorter distance! But I wanted to fly so I slewed into the air at 1,500 feet and somehow airborne there was no problem controlling the plane. 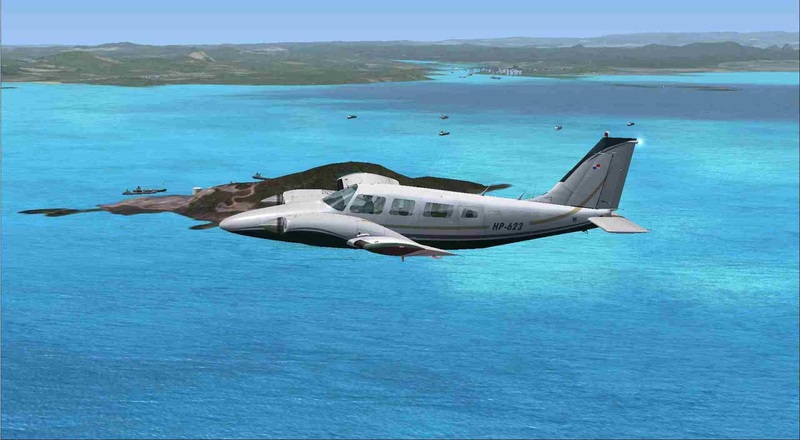 Then I flew to Taboga Island because I had setup NAV1 with TBG VOR prior to departure. That was nice, a photoscenery I was developing and then someone on FSDeveloper.com stole it and published it as his own, not very ethical! Since I had also to reinstall my OS and FSX many months ago, my whole setup was unconfigured. Imagine that just a couple of days ago I managed to get some spare time to setup all the Panama scenery I had developed over the years! 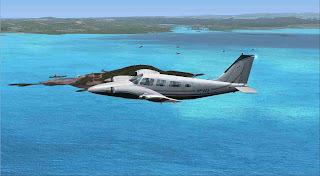 I must say despite the problems taking off it has been of much pleasure to get back into flight simulation. I took the opportunity of this test flight to fly around the city and test the throttle quadrant now that I had fixed the axis bounce problems. Before that it was just terrible, both engine throttles would bounce up and down and would not go their full range. The third lever I used for flaps and it would just activate and deactivate by itself. Luckily during this test flight I could attest that the bounce issue was now totally gone, I did a good job at that but it took me hours to complete. It was enough flying around Taboga Island. I wanted to see if the aircraft could develop enough power for take off. I headed off to the Panama Pacífico (MPPA, formerly Howard MPHO) for a touch and go. On the photo on the right you can see a bit of Taboga and at the distance in the background MPPA. During approach engine throttles behaved really well and so did the flaps. The landing was soft and uneventful, I did not do a full stop and just bothered for mid-speed and then take off. At least from that mid-speed the aircraft managed to develop enough power to take off from MPPA. After take off I did a sharp tight right turn over the Pacific entrance of the Panama Canal as if heading towards TBG VOR again but then another sharp left turn for a perfect landing at my departure airport Marcos A. Gelabert (MPMG). Heading to the gate at MPTO. Approach chart shown. I made a perfect ILS landing at MPTO runway 03R (INAT 110.70 on NAV 1, course 029 degrees). While at it I also tried my two-monitor setup with an old monitor. This time only showing my navigation charts on the smaller monitor. It worked well, better than my previous setup that was glitchy on multi-monitor. There were several AI aircraft on the gates, a couple of Global Airlines Boeings and an McDonnel Douglass. During the test flight I saw two Boeings some 6nm to my right, heading and leaving MPTO while I circled around Taboga VOR. Unfortunately once I was at the gate a baggage car crashed into my nice Piper Seneca II because the driver was very distracted chatting through WhatsApp on his smartphone. Still troubled by the engine power I decided to try a single engine that did not require much runway for take off. 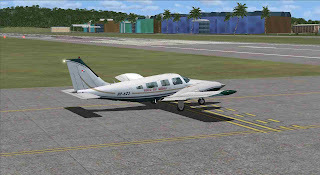 I loaded my Cessna 172 for take off from Rambala Aeronaval base in Bocas del Toro. I must say it did take off. 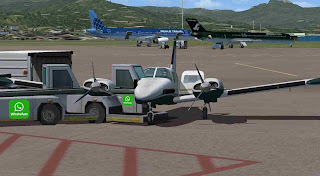 But then I noticed that while my throttle levers where running smoothly, my FSX configuration had gotten all screwed up. Even though my throttle levers moved from 0 to 100% the percentage given in FSX was between 29% to 71% so it was not properly going to idle and it was not giving full power either! In this new flight I setup my radio stack and the GPS on the secondary monitor just to see how FSX performed. It appears my motherboard videocard performs better with FSX using two monitors than when I had my old nVidia GTX video card. I also spent a bit of time doing a Boeing 737 approach somewhere in Eastern Europe. I have not flown those bigger aircraft on FSX for a long time so I am much out of practice and not to mention the stock Boeing is really lame, you cannot even operate the Speed Brake rotary button using the virtual cockpit! you have to switch to 2D cockpit in order to do it. But I used this B737 test flight just to test my Go Flight MCP Pro with the latest driver and yes, it still works after all these years! I use this Boeing MCP (Autopilot) to operate the autopilots of all the aircraft I have in my hangar. It is not like the one in their virtual cockpit but accomplishes most of the basic functions. The serviced Saitek Throttle Quadrant is performing well, even the calibration utility shows it is responding to all buttons and full range on all three levers, therefore the electrical contact cleaning was successful. 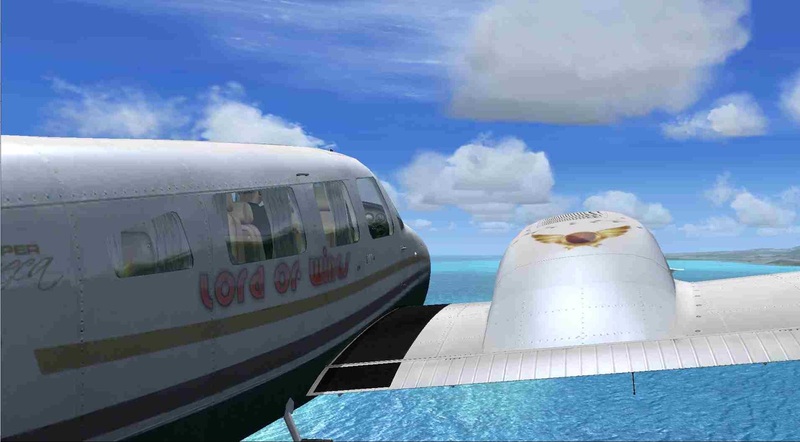 However, my FSX configuration appears to be all screwed up. I acknowledge I did not have time for a proper FSX backup because my Windows 7 got totally screwed up when I tried to upgrade to Windows 10 a few years ago, I had to reinstall Windows 7 and all my software from scratch and my FSX configuration suffered greatly. Basically I am now reconfiguring sensitivity and dead zone values on the axis used for control surfaces. I am beginning to doubt that FSX properly saves those setups well. But enough for now. 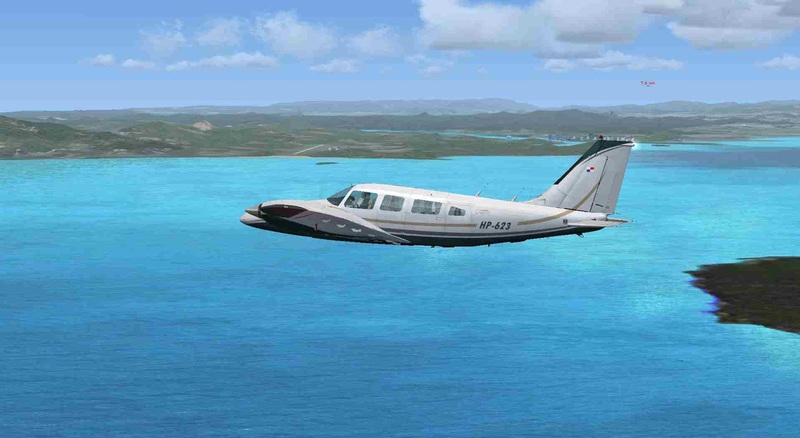 I enjoyed 0.80 hours of Visual Flight on two highly enjoyable aircrafts: The Piper Seneca II from Carenado and the default Cessna 172.